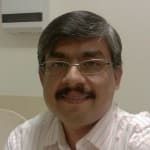 Dr. Biswajit Dutta is a renowned Orthopedist in Anna Salai, Chennai. He has been a practicing Orthopedist for 21 years. He is a qualified DNB (Orthopedics), Diploma In Orthopaedics (D. Ortho), MBBS . You can meet Dr. Biswajit Dutta personally at Apollo Speciality Hospital in Anna Salai, Chennai. Don’t wait in a queue, book an instant appointment online with Dr. Biswajit Dutta on Lybrate.com. Have osteoarthritis. What should be the treatment. Have bad pain in knee even cant walk. If the pain is intolerable take pain medicines prescribed by a local doctor. Walk regularly. Maintain a healthy weight. Eat plenty of green leafy vegetables and fruits. Drink plenty of water and fruit juices. Do stretching and strengthening exercises for quads and hamstring muscles around the knee joint. Approach a physiotherapist to help you out with the exercises. When all this do not help opt for total knee replacement. Hi I am 18yrs old female I have rheumatoid arthritis from past 4 months. I have lot of joint pains and inspite of taking my pain killers daily there is no sort of difference in me. Could you please suggest me some remedies ? Visit a good rheumatologist who will perform blood tests the exact problem. On the basis of the blood results he will put you on several medicines in addition to pain medicines that will help control inflammation. On your part exercise regularly. Eat fresh green vegetables and fruits. Drink plenty of fluids. If there is considerable joint damage you will benefit immensely from joint replacement surgery. I suffer from knee pain. Actually when I bend my knee I hear some noise and it is paining when I try to balance one side when ever I bend my knee I get pain n noise. I suffer from this pain for two years. You are likely to have osteoarthritis of the knee joints. It is a condition where the cartilage layer is worn out exposing the underlying bone. When bone rubs on bone, there is crackling noise and you get pain. Eventually the knee stiffens up making it difficult to walk. To get rid of pain, do stretching and strengthening exercises for muscles around the knee joint. Eat green leafy vegetables and fruits. Walk daily. Take pain medicines if necessary. I am 28 year old female with effects of juvenile rheumatoid arthritis, which I got at the age of 4. I weigh around 76 kg and this has been constant for a year. I did not notice any reduction in weight even if I have diet and exercise. As daily walking gives me knee pain I am not able to go for walk or jogging. Please let me know any alternate methods to reduce my weight. Thanks. Do the following: 1. Take adequate pain meds to keep the arthritis under control 2. Do stretching and strengthening exercises for muscles around the joints affected 3. If joints are warm, keep ice packs to reduce inflammation 4. Do diet control. Reduce all food that is white in color like rice, sugar, milk and so on. 5. Do underwater exercises in a warm pool or bathtub. 6. Once pain is reduced resume daily walking. 7. If pain is unbearable consider knee replacement surgery. Youngest patient to undergo knee replacement in our hospital was 25 years old, but she had badly damaged knee joints. Good luck! I am 53 years. Self employed. And suffering from knee & jt. Pains. Wt. 90 kgs. With obesity. Please Advice. I am 23 year old boy. I playing football while my leg ligament is fractured. How can overcome from fracture without operation. Now I can't run. While I am stress my ligament get fractured again. You must be having a ligament year. At your age, the ligament is necessary for stability of the knee especially when running, jumping, climbing steps and fast walking. I suggest strongly that you take mri of the knee to confirm the torn ligament. If the ligament is torn, undergo ligament reconstruction by keyhole surgery. This will restore stability in your knee and prevent further injuries to your knee joint. The bend in the bone cannot be corrected by medicine or physiotherapy after it has united. It is is mechanical problem and can be set right only by surgery. I am 64. Suffering from osto arthrities. What should I do to get rid of pain while walking? Do adequate amount of stretching and strengthening exercises for quads and hamstring muscles around the knee joint. This will relieve stiffness and maintain mobility in the knee. Use cold packs on the knees if they turn out to be warm. I am a 70 years old suffering from osteoarthritis of both knees for several years. I also have prominent varicose veins behind the knees. What are my treatment options? there are full page ads by healthcare clinic in the newspapers claiming cure?Kindly advise. At your age the arthritis in your knee joints must be in an advanced stage. Hence total knee replacement will relieve your pain and restore mobility to a great extent. Varicose veins behind the knees may not be a problem for doing the surgery, but it can predispose you to develop dvt after surgery. If adequate precautions are undertaken to prevent dvt, then your surgery and postoperative period will turn out to be uneventful. I met with an accident on 09/02/2015 and suffered fracture in left medial malleolus and fracture neck of right femur and now its been 3 months I m still in pain and also have complaints about leg shortening as I have gone through dhs on right leg and screw implant in the ankle. Please assist as to how much time it will take and what are the consequences of these kind of fractures. Shortening of the leg after fixation should not happen. Either the fixation was not properly done or you have developed a condition in the hip known as avn. This commonly occurs in those with fracture neck of femur. Please mail your xrays in private to me. I can tell if you have avn of the hip joint.